What is an Area Health Education Center? An Area Health Education Center is a resource for students and other career seekers interested in health careers and for communities and providers who want to improve the health of their communities. 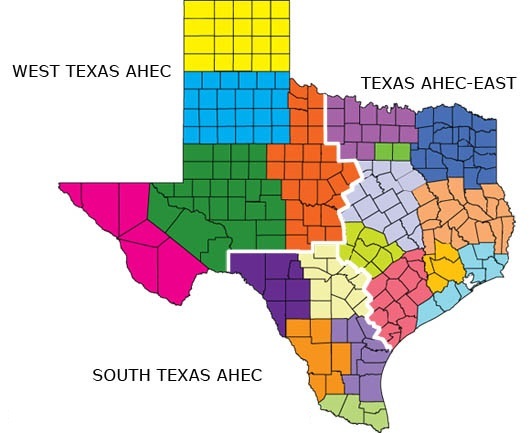 There are three Area Health Education Center (AHEC) programs that serve the State of Texas: Texas AHEC - East, South Texas AHEC, and West Texas AHEC. Each program has regional AHEC centers to serve several counties. While each AHEC program is unique, they all three have a similar mission: to improve the health of communities by developing the health care provider work force. In each region, the actual work to accomplish this may vary, depending on that area’s needs. Some AHECs may do more in one of these goals than in the others. However, they all work to improve the health care work force for the region they serve. To accomplish this, AHECs work closely with high schools, colleges and universities, community-based health care professionals, community leaders and students. The AHECs offer several different opportunities for high school students to learn more about health careers. AHEC staff offer classroom presentations about health careers, participate in health and career fairs, and host health career summer camps as well as other hands-on activities. For more information, contact the AHEC that serves your region.